- All photos by Jim Mason Chaplin Nature Center is located on the inner edge of a bend in the Arkansas River. More than five miles of walking trails provide easy access to bottomland timber & prairies, upland prairies, a spring-fed creek, and the Arkansas River. You may pick up a trail map at the visitor center. The varied habitat has attracted 225 species of birds, including tree sparrows, Harris' sparrows, rufous-sided towhees, cedar waxwings, and Carolina wrens. The woodlands harbor a good diversity of tree species, including black walnut, pecan, cottonwood, sycamore, red elm, and a showy springtime display of redbuds. Pileated woodpeckers inhabit the bottomlands, along with wood thrushes, wild turkeys, bobcats, and white-tailed deer. The rough green snake, a favorite of reptile lovers, is sometimes seen. A popular wintertime activity is watching bald eagles from the riverbanks. 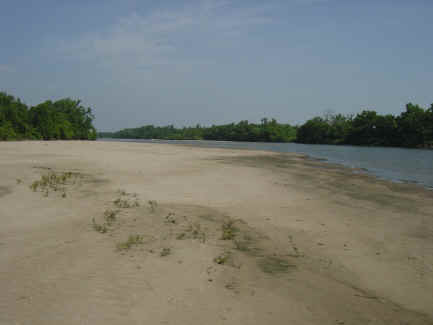 Sandbar on the Arkansas River at Chaplin Nature Center The sandbar on the river is 1/4 mile long when the river is low. During summer, it is alive with tiger beetles, dragonflies and killdeer. Look for tracks of deer, coyote and raccoon as well as the occasional female water turtle either going to or coming from her nest above the high water line. 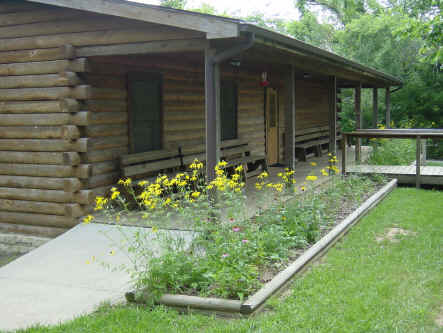 The visitor center features wildlife displays, a nature library, a gift shop, and a bird observation area located on a second-floor open deck bordered by tree canopy and serviced with bird feeders. It provides an ideal spot for bird photography or bird watching from the comfort of the library. In winter you may see white-breasted nuthatches, downy woodpeckers, red-bellied woodpeckers, American goldfinches, dark-eyed juncos, and northern cardinals. In summer ruby-throated hummingbirds frequent the feeders and eastern bluebirds use the nest boxes provided. The trailhead for exploring the area lies just behind the visitor center. 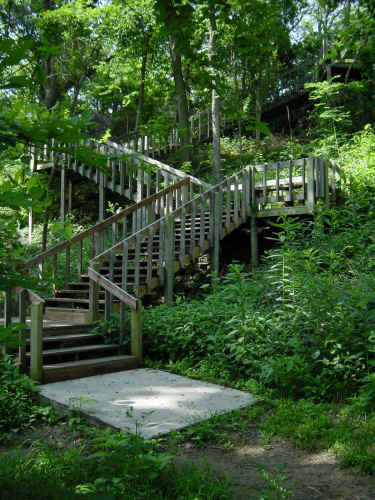 Since the building is located on the edge of a steep bluff, this boardwalk stairway provides a handy means of descent. The view from the top platform of the stairway is level with the bottomland tree canopy, making it a great spot to look for warblers. 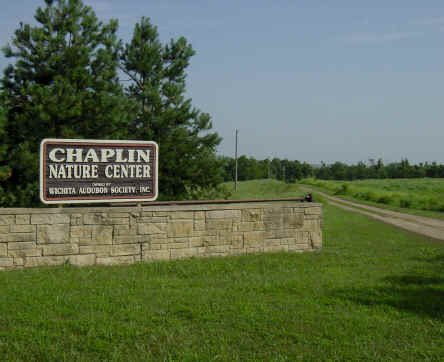 For the wildlife watcher, a visit to Chaplin Nature Center guarantees success! Help count and identify butterflies as part of a North American Butterfly Association official count. This one-day survey will count all the butterflies seen in a 15-mile diameter area. More experienced counters will be teamed up with novices, so everyone is welcome to help. For more information call CNC. Meet at the visitor's center at 8:30 a.m.
Take a walk on the wild side and discover some of nature's natural bounty. Participants will hike along the trails and identify some of the more common edible and poisonous plants. Advance registration required. Directions: From the intersection of U.S. 77 and U.S. 166 in Arkansas City (50 miles south of Wichita), travel 3 miles west on U.S. 166, then north 2 miles on 31st Road, which turns west to become 272nd Road. Signs are provided for assistance. Click here to visit their web site for more information on seasonal hours and scheduled programs.